In level flight, the “Separation Point” is at the forward-most part of the wing providing the typical flight characteristics that the wing was designed for. 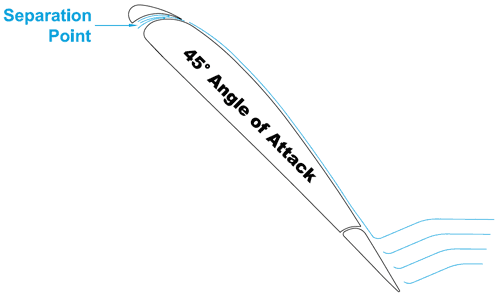 When the angle of attack increases on a standard wing, the “Separation Point” moves down and back, decreasing the airflow over the wing’s top surface. This results in the onset of boundary-layer air separation. As the angle of attack is increased, the “Separation Point” continues to move aft until the wing is completely stalled. When the angle of attack is increased on the “Slotted Wing“, the “Separation Point” moves into the slot opening. As this air passes through the slot, it is compressed and exits the slot with increased velocity, which “re-energizes” the boundary layer of air and delays the onset of stall. This allows the aircraft to be flown at very high angles of attack on takeoff and landing with good wing stability (as seen in the video demonstration above). Additionally, the leading edge slotted wing is VERY resistant to power-off spins and completely resistant to power-on spins. This added benefit greatly increases the safety margin on the aircraft, especially for bush flying. The “Stall Warning” in a standard wing Cub is marginal at best, and many highly modified Alaskan Cubs exhibit a marginal or non-existent stall warning. The leading edge slotted wing provides for increased stall warning. With the extremely high angles of attack that are possible with this wing, the tails stalls significantly before the wing. This condition induces a definite control stick shake that is easily felt by the pilot. This stick indication increases the margin of safety before the wing reaches a fully stalled state. A Vortex Generator (VG) creates small vortices that increase in diameter as they move aft. This means there are areas of boundary-layer air that do not receive any benefit from the vortices. There is also an area directly behind each pair of VGs that remains unaffected by the controlled vortices. The width “W” of unattached boundary-layer air increases as airspeed decreases. The “Critical Stall Area” between lines A and B dictates that airspeed be increased, angle of attack decreased, or HP increased. Vortex Generator manufacturers state on their STC’s: “If more than 5 vortex generators are missing, the aircraft is NOT AIRWORTHY”.